There seems to be a continual debate as to whether God controls the weather, especially when we see these natural catastrophes that destroy so much and kill so many. The debate need not be! 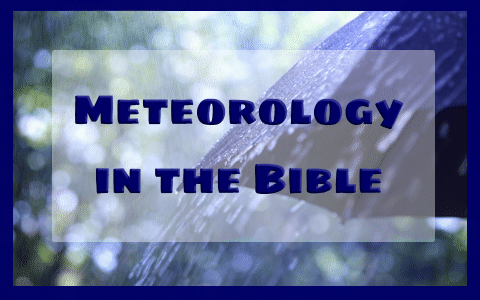 The Bible is clear on weather and the study of it, which is also called meteorology. Look at what I found about meteorology in the Bible in these 35 KJV verses. Psalm 77:17 The clouds poured out water: The skies sent out a sound: Thine arrows also went abroad. Genesis 27:28–29 Therefore God give thee of the dew of heaven, And the fatness of the earth, And plenty of corn and wine: Let people serve thee, And nations bow down to thee: Be lord over thy brethren, And let thy mother’s sons bow down to thee: Cursed be every one that curseth thee, And blessed be he that blesseth thee. Psalm 78:47 He destroyed their vines with hail, And their sycomore trees with frost. Deuteronomy 11:17 And then the LORD’s wrath be kindled against you, and he shut up the heaven, that there be no rain, and that the land yield not her fruit; and lest ye perish quickly from off the good land which the LORD giveth you. 1 Kings 8:35–36 When heaven is shut up, and there is no rain, because they have sinned against thee; if they pray toward this place, and confess thy name, and turn from their sin, when thou afflictest them: Then hear thou in heaven, and forgive the sin of thy servants, and of thy people Israel, that thou teach them the good way wherein they should walk, and give rain upon thy land, which thou hast given to thy people for an inheritance. Joshua 10:11 And it came to pass, as they fled from before Israel, and were in the going down to Beth-horon, that the LORD cast down great stones from heaven upon them unto Azekah, and they died: they were more which died with hailstones than they whom the children of Israel slew with the sword. Genesis 8:1–3 And God remembered Noah, and every living thing, and all the cattle that was with him in the ark: and God made a wind to pass over the earth, and the waters asswaged; The fountains also of the deep and the windows of heaven were stopped, and the rain from heaven was restrained; And the waters returned from off the earth continually: and after the end of the hundred and fifty days the waters were abated. Previous post: What Is The Christian View Of Psychics?